We are just days (DAYS I tell you!) away from our 2014 Quilt Show! We hope you’ll join us Opening Night. If you can’t join us then, remember it continues through the entire month of October. So, bring a friend, bring a neighbor, bring a little cash….because we have an amazing Raffle Quilt! $1.00 per chance to win or 6 for $5.00. While this month’s Flaunt Your Finish projects are not in our Quilt Show, they are all lovely nonetheless and will give you a hint of what you can expect to see at the show. First up is Elizabeth R. (As we now have TWO Elizabeth Rs, Queen Elizabeth’s moniker may need to go public. This is not QE, as she will be heretofore known.) As I was saying…Elizabeth R. is ready for October decorating. 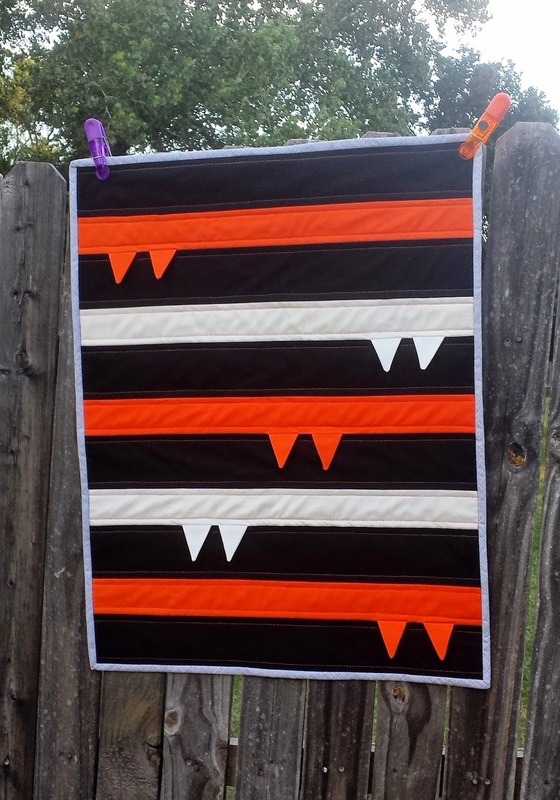 This is a modification of the “Fang Table Topper” from the September/October issue of Quilty magazine. Instead of a table topper though, Elizabeth cut it in half so that it can be hung on her front door. Eek! What a great idea! Next up is Melissa S. Melissa’s poor husband was the last person in the family to get a quilt, so Melissa made it worth the wait. 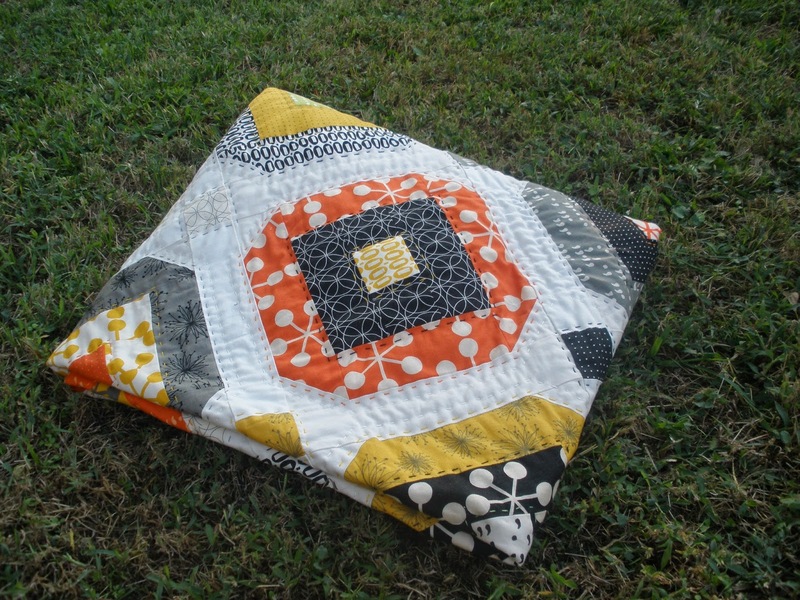 The entire quilt is hand-quilted with size 8 Perle cotton. 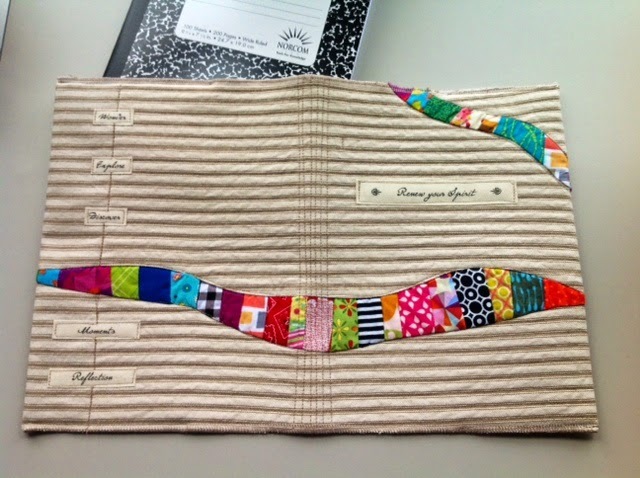 Beautiful job Melissa!...and a shout out to that Comma fabric by Zen Chic that so many of us love. 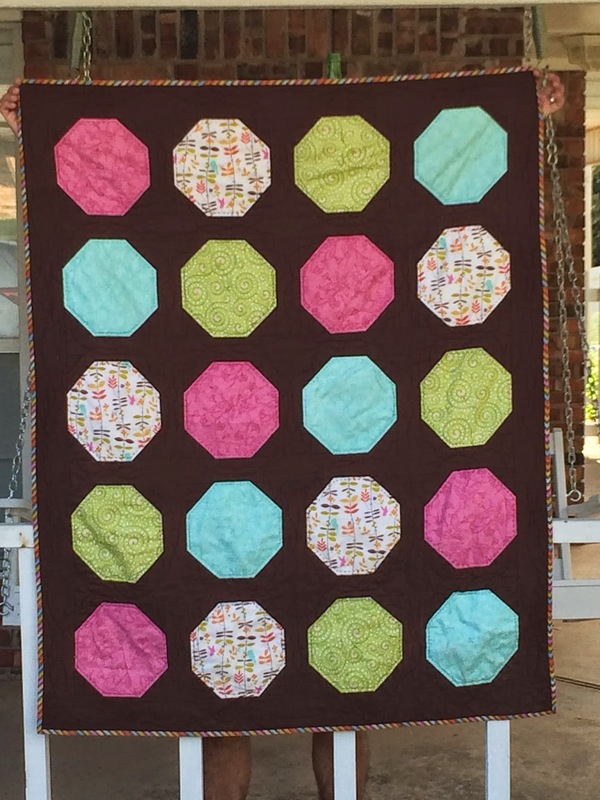 This next sweet quilt was lovingly made by Amanda L. for her 4-year old daughter. It’s been a long-time in the making, as Amanda has been collecting fabrics since her daughter was a baby. It is a scrappy look with oversized tumblers. In the center, Amanda quilted the words “A Dream is a Wish Your Heart Makes”, which is the lullaby she used to sing to her as a baby. She placed the title in two echoing ovals and then stippled the remainder of the quilt to help the center stand out. 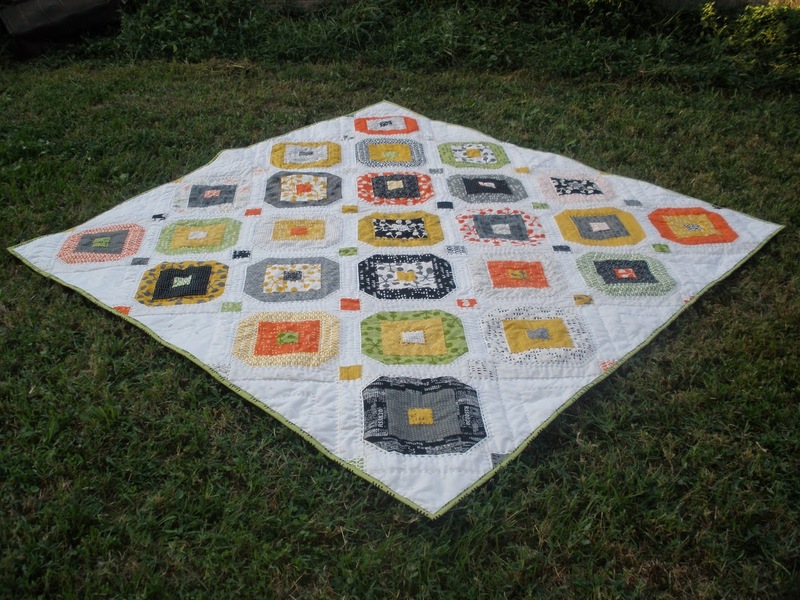 This is such a sweet and lovely quilt! 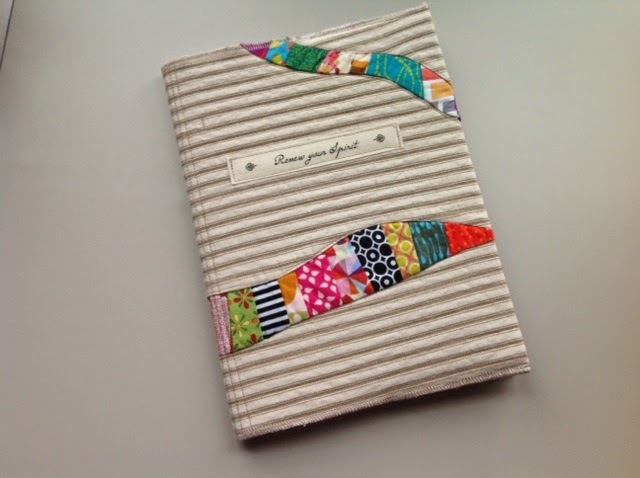 Agnes S. has two finishes to share this month. The first is a quilt called “Never Ask for Directions”. 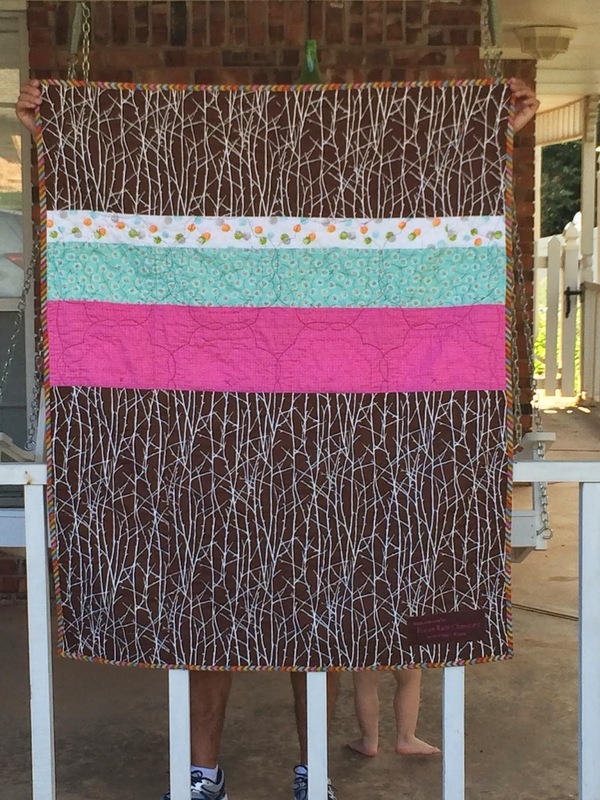 She used the arrow block from the guild’s 2013 Block-of-the-Month and made it in two sizes (12 inches and 6 inches). Agnes wanted to do something directional, with arrows, and a bright palette of colors. The background indigo weave fabric is one she will be using often…after so many grays, she’s ready for a new favorite! 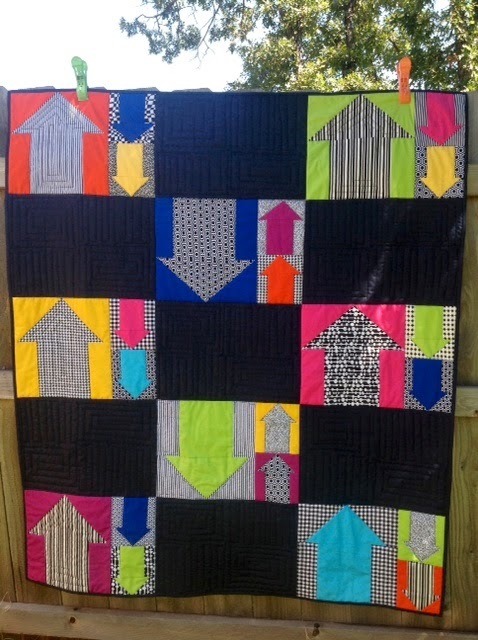 I love how the quilting inside the arrows echoes the shape. Fun! Agnes has also been thinking about a variety of projects that can be made with little leftover morsels of fabric (in the best tradition of quilting, she tries to use up every last bit!) Here's a great modern cover for those bland notebooks. Robin O. also has two finishes this month. The first is “ConVivial Company”. Named in honor of its recipient, this quilt will be given to Robin’s new niece. It is made in the colors of her nursery (which Robin says was a bit of a stretch for her color-wise) and she’s most proud of the hand-quilted octagons and the hand-stitched dedication on the back. I love the color combination and know it will be well-loved and treasured. Robin is a second-generation quilter, so both her husband and her father like to playfully complain that they are “quilting widowers”. 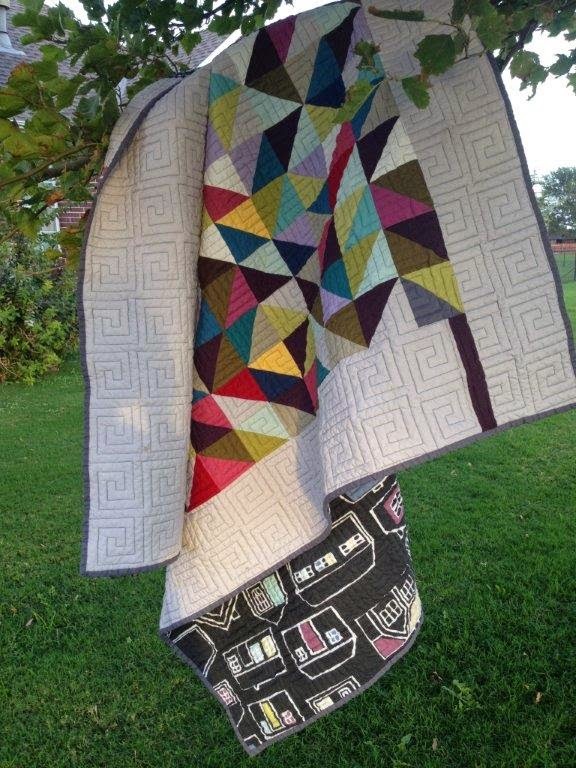 This particular sewing project (a game board for her husband’s Star Wars X-wing miniatures game) was basically a bribe to remind her husband that he benefits from her quilting too. The mat is 36” x 36”. 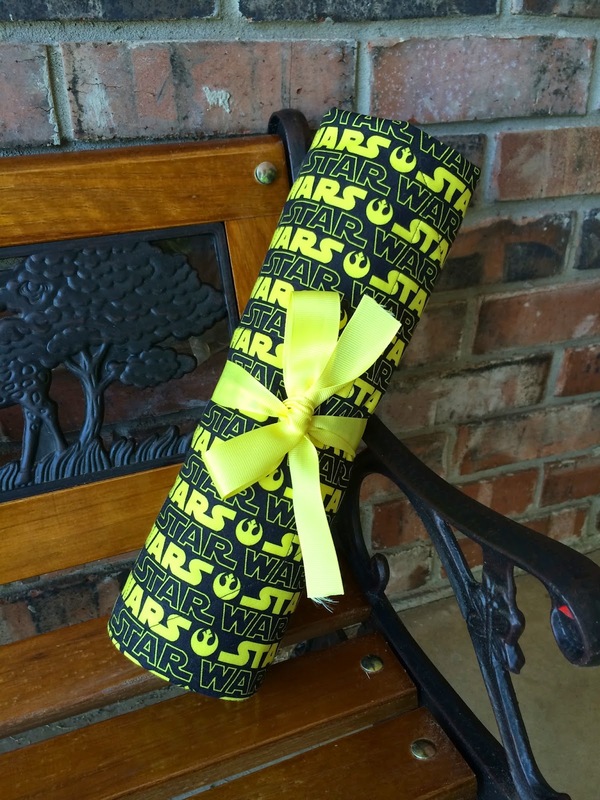 She used a Smithsonian Museum print for the front and some licensed Star Wars fabric for the back. Now her husband can take this to game nights and Robin can get some more quilting in! 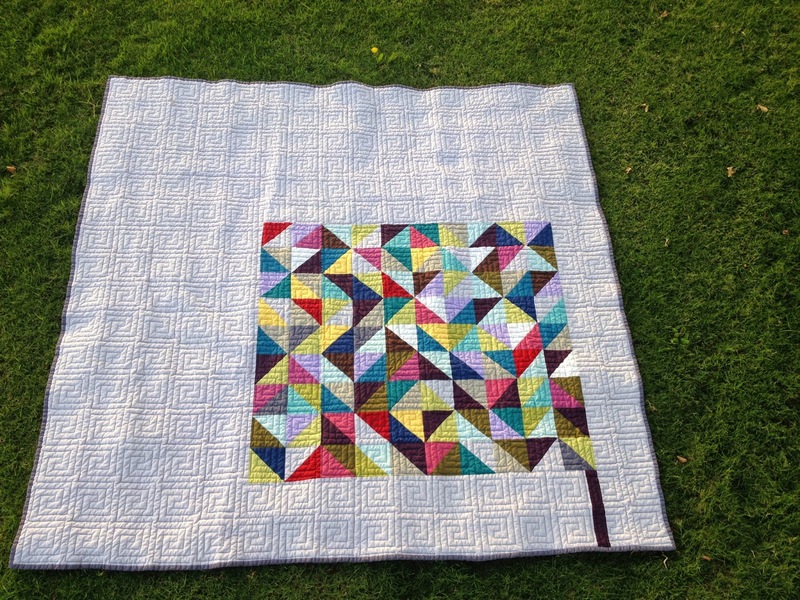 And to wrap up this month’s Flaunt Your Finish, Trina K. has this amazing quilt to share. This was Trina’s first go at half-square triangles. She wanted to use all solids (she used Kona solids) and was inspired by a quilt she saw on Pinterest. She picked out the quilting pattern, but didn’t quilt it herself. The back fabric is from IKEA, and it is definitely a keeper! Wow! 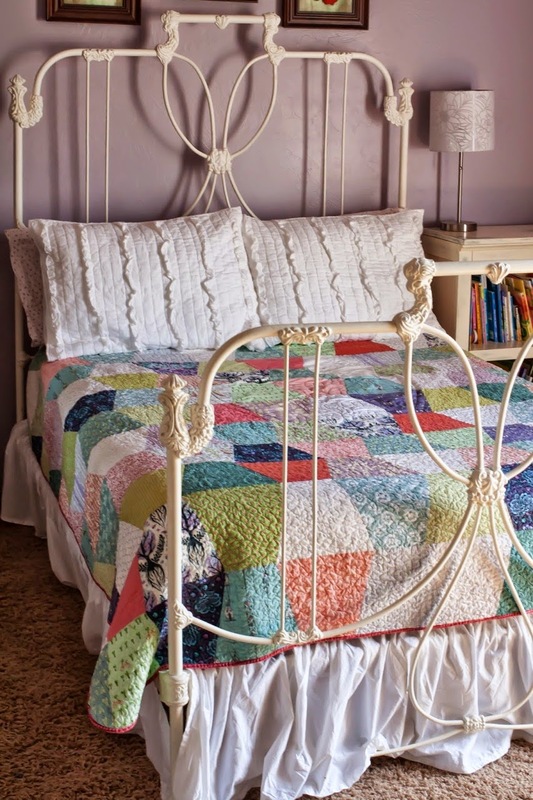 Amazing layout and amazing quilting! There you have it, another great month of finishes. If you like what you see (and really, why wouldn’t you?) please join us at our Quilt Show. 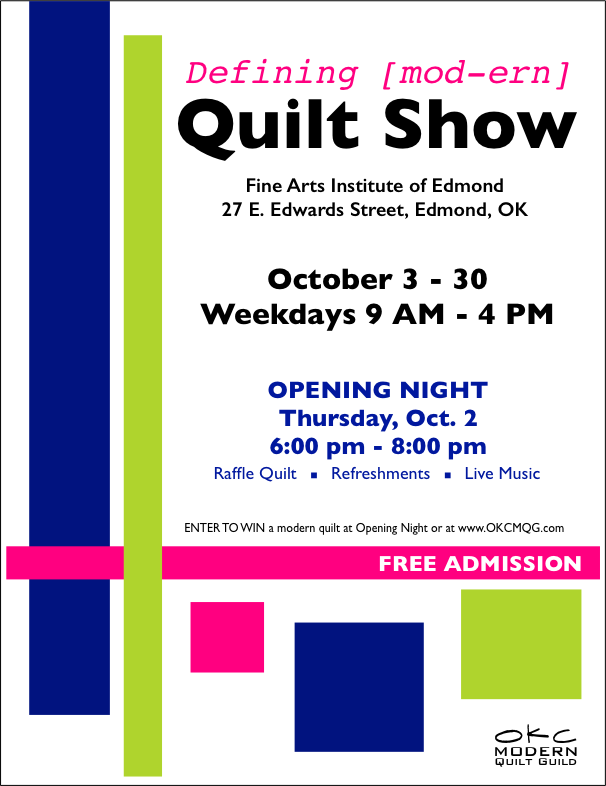 Opening Night is Thursday, October 2, 2014, 6 pm - 8 pm at the Fine Arts Institute of Edmond, 27 E. Edwards. We’ll have our raffle quilt on display, treats to eat, live music and an array of fantastic quilts. What could be better? Link up your finish below and share our button on your own blog!